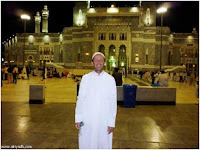 Miliyuner an American, Mark Shaffer declared his Islam in Saudi Arabia on Saturday, October 17th, 2009 ago. At that time Mark was a trip to Saudi Arabia to visit some famous cities like Riyadh, Abha and Jeddah for 10 days. Mark is a famous miliyuner and lawyer in Los Angeles, United States, especially related to civil law. The last major case he handled was a famous American pop singer Michael Jackson, a week before he died. A tourist guide who accompanied Mark for 10 days in Saudi Arabia, Dhawi Ben Nasir told: From the foot for the first time in Saudi Arabia, Mark began to ask questions about Islam and prayers. Upon arrival in Saudi, Mark stayed in Riyadh for two days. While in Riyadh, Mark was very interested in Islam. After that we moved to the city of Najran, continues to Abha and Al-Ula. There is visible interest in Islam, especially when we ventured out into the desert. Mark was amazed to see three young Saudis who accompany us in Al-Ula, because they prayed in the expanse of a vast desert. What an amazing sight. After two days in Al-Ula, we went to Al-Juf. Arriving at the Al-Juf, Mark asked dicarikan books on Islam. Then I gave some books on Islam. All books are read out by Mark. The next morning, he asked me to teach prayer. I then taught how to pray and ablution. Then he joined the prayer on my side. We then went to a mosque not far from our hotel in Jeddah. A bit late, I and some pilgrims pray outside the mosque because the congregation is mebludak. Visible Mark observe congregational especially after Friday prayers, they greet one share with a face so bright and cheerful. Mark the kagung with the sight. When we returned to the hotel, suddenly Marka convey to me his desire to convert to Islam. Then tell him sya: Silahakan you shower first. Seteah he took a shower I've coached Mark utter two sentences he shalata Sunnah creed kemudain two cycles. After that, Mark mengungkapakan his desire to visit the Haram Mosque in Mecca and pray there before he left Saudi Arabia. To be able to realize his wishes, we went to the office of Da'wa and Al-Ershad in the region Hamro 'Jeddah to take formal evidence of Islam in order to enter Makkah and the Haram Mosque. Then Mark was given a temporary certificate to Islam. Because some members of the group who followed Mark's visit to Saudi Arabia had to go back to America on Saturday afternoon, Al-Hamdullah, Ustadz Muhammad Turkistani willing to deliver the Mark to Haram of Mecca that very morning. Related to Mark's visit to the Haram Mosque, Muhammad Ustazd Turkistani told: after Mark while we also obtain a certificate of Islam went directly toward a noble Haram Mosque. Armpit he saw the Haram Mosque, was apparent in his face very bright and emit a tremendous joy. When we entered the Haram Mosque and the Kaaba witnessed firsthand, his excitement grew. By Allah, I could not express with words that scene. After beliu tawaf around the Kaaba is noble, we are praying sunnah and then out of the Haram Mosque. I see Mark sngat weight to part with the Haram Mosque. After Mark declared his Islam, he could reveal the true happiness in Al-Riyadh newspaper as saying: I could not express my feelings at this time. However, now I am being reborn and my life has just begun ... Then he added: I am very happy. The happiness that I felt I could not express to you when I visited the Haram Mosque and the Kaaba is noble. Related to question a step forward after he converted to Islam, Mark explained: I will learn more about Islam, will explore the religion of Allah (ie Islam) and will return to Saudi Arabia for the Hajj pilgrimage. Driving factors related to Islam, Mark explained: I have already had information about Islam, but very little. When I visited Saudi Arabia and witnessed the Muslims in Arabia and I saw how they pray, I felt a strong urge to know more about Islam. When I read the correct information about Islam, I believe that Islam is the religion of truth (right). Sunday morning 18 Okteber 2009, Mark left the King Abdul Aziz Airport Jeddah to America. Before leaving Jeddah, when filling in the immigration form, Mark put his religion is ISLAM.